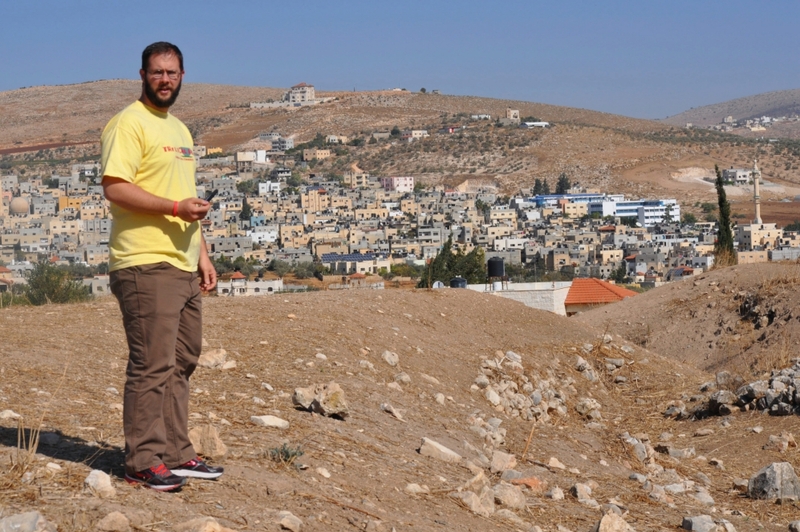 On our recent trip to Israel we included one day in the West Bank. On our itinerary among other sites for that day I included Tirzah, Israel’s capital prior to Samaria, during the earlier years of the Divided Kingdom period. Why is this region generally less known? Most tour groups avoid it. Yes, it is possible to come to Israel and not see Shechem, Samaria, Shiloh, and Ai. In fact, I would estimate that 95% of tourists never see these major sites. (April 28, 2014, in BiblePlaces Blog). What Todd says here would also (and especially) be true of Tirzah! We did not visit Ai, but saw each of the other sites mentioned: Shiloh, Shechem (Tel Balata, and also Jacob’s Well at Nablus), Samaria and also Dothan. This aerial photo is the view of Tirzah from the north, used by permission of Todd Bolen. Tirzah, aerial from north. Photo ©Todd Bolen. 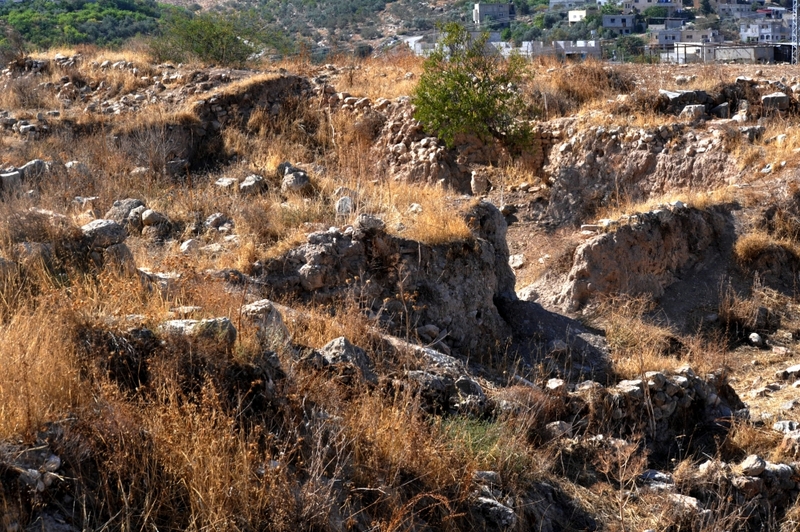 It is ironic that this important Old Testament city is today an unmarked tel. Not even a sign. Many decades have passed since the excavations here. Excavations at Tirzah. Photo ©Leon Mauldin. My son Seth at Tirzah. Photo ©Leon Mauldin. View from Tirzah. Photo ©Leon Mauldin. 1 Kings 14:17 Then Jeroboam‘s wife arose and departed, and came to Tirzah. When she came to the threshold of the house, the child died. Jeroboam was the first king of the Divided Kingdom following the death of Solomon. 1 Kings 15:21 Now it happened, when Baasha heard it, that he stopped building Ramah, and remained in Tirzah. Baasha was the king who destroyed all the family of the King Jeroboam. 1 Kings 15:33 In the third year of Asa king of Judah, Baasha the son of Ahijah became king over all Israel in Tirzah, and reigned twenty-four years. 1 Kings 16:6 So Baasha rested with his fathers and was buried in Tirzah. Then Elah his son reigned in his place. 1 Kings 16:9 Now his [Elah’s] servant Zimri, commander of half his chariots, conspired against him as he was in Tirzah drinking himself drunk in the house of Arza, steward of his house in Tirzah. 1 Kings 16:15 In the twenty-seventh year of Asa king of Judah, Zimri had reigned in Tirzah seven days. And the people were encamped against Gibbethon, which belonged to the Philistines. 1 Kings 16:17 Then Omri and all Israel with him went up from Gibbethon, and they besieged Tirzah. 1 Kings 16:23 In the thirty-first year of Asa king of Judah, Omri became king over Israel, and reigned twelve years. Six years he reigned in Tirzah. Tirzah is located seven miles NE of Shechem; it is situated near the source of the Wadi Far’ah, which drains down to the Jordan. It was W.F. Albright who identified the site with biblical Tirzah. Roland de Vaux gives a good summary of Tirzah’s identification and history in The New Encyclopedia of Archaeological Excavations in the Holy Land. The stratum attributed to the Late Bronze Age shows signs of destruction, which can be regarded as the result of the Israelite conquest [of Canaan]. Tirzah, as the capital of the kingdom of Israel, corresponds to stratum III at Tell el-Far’ah. This level was devastated during the Omrid capture of the town, subsequent to Zimri’s seizure of power (c.885 BCE). The fortress in the northwestern corner may be the king’s castle mentioned in 1 Kings 16:15-18, which Zimri himself set on fire and in which he met his death. Omri was able to rebuild Tirzah and to set up his residence there only at the end of a four-year struggle with his rival, Tibni. The foundations sunk into level III probably belong to his structures. 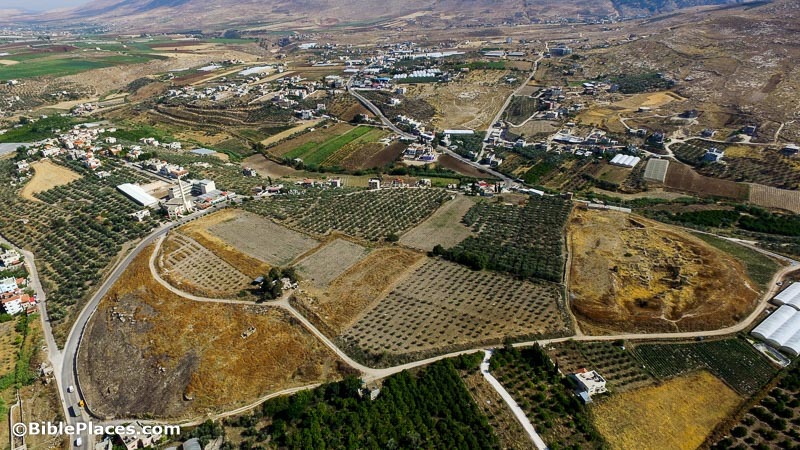 However, after two years, Omri transferred the capital to Samaria (cf. 1 Kg. 16:23-24). This explains why there are buildings in the area that were never completed. The royal household and military and state officials left Tirzah, undoubtedly followed by the artisans and merchants. It is quite possible that the town was completely abandoned for some time. This would explain the paucity of the interim stratum, apparently constructed after a short period of settlement. As the Northern Kingdom flourished under Joash and Jeroboam II, Tirzah, too, enjoyed a measure of prosperity. 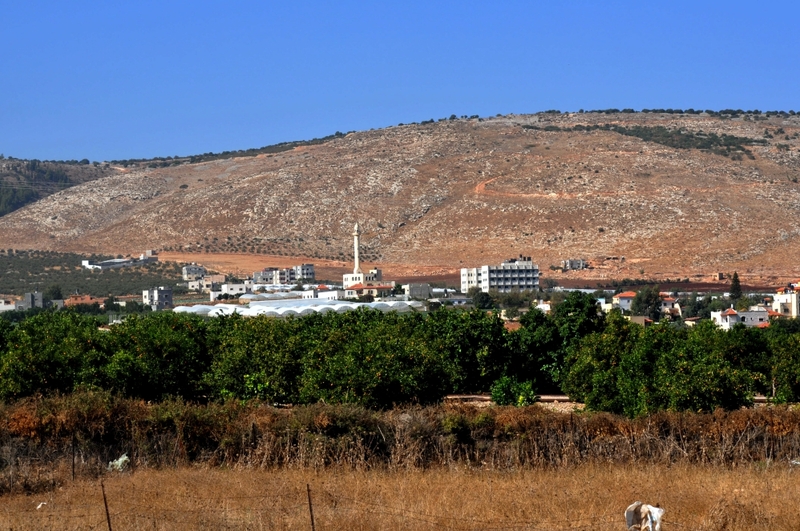 It is from this town that Menahem launched his attack on Samaria (2 Kg. 15:14). Stratum II represents this era with its magnificent structures and administrative headquarters. As some have suggested, these may have served Menahem, if indeed he held sway at Tirzah. During the Assyrian invasion of the Northern Kingdom (c. 732 BCE), the town was captured. The destruction in stratum II dates from that time. The École Biblique et Archéologique Française in Jerusalem conducted nine seasons of excavations at the site, between 1946 and 1960, under the direction of R. de Vaux (Vol.2,p.433). Omri began his reign in Tirzah (1 Kings 16: 23), the capital of the northern kingdom during Baasha’s reign, and then built a new capital, Samaria. At Tirzah, identified as Tell el-Farah north along Wadi Farah about six miles northeast of Shechem, excavators have discovered that the Iron Age strata have a break and gap that match the point when Omri built his new capital. Apparently, he had begun new construction in Tirzah and abruptly stopped. Perhaps Omri began to rebuild Tirzah as his capital during the time of the conflict with Tibni. Once that conflict was resolved, Omri was free to establish his own new capital (IVP Dictionary of the Old Testament: Historical Books). This entry was posted on Wednesday, November 30th, 2016 at 5:11 PM and is filed under Archaeology, Bible History and Geography, Bible Places, Israel, Old Testament, photography, Travel, Uncategorized, West Bank. You can follow any responses to this entry through the RSS 2.0 feed. You can leave a response, or trackback from your own site.